Frankly, I don’t usually pay cover. I’m just cheap. So I avoid events and venues that require cash just to walk through the door. But every rule has its exception. And for the dedicated cheapskate, warehouse clubs raise a conundrum. You’ve got to pay to get in, but the deals inside are better. At least, that’s the idea. Is a Sam’s Club Membership Worth it When You Can Just Shop at Walmart? Buying in bulk to save money on groceries and household items is a pretty entry-level rule of thumb for aspiring skinflints. 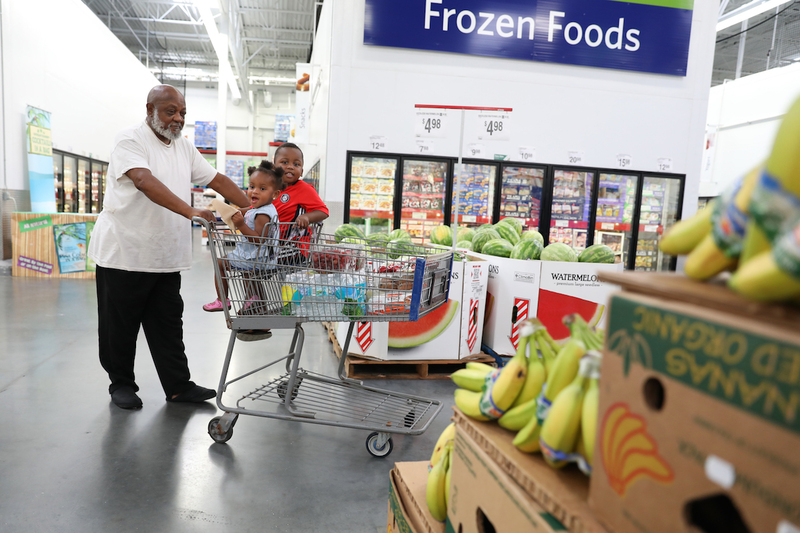 That’s why we’ve written so much about warehouse clubs here — from their weird, hidden perks to their not-so-scary price hikes to their best deals for couples and parents. But after reading my comparison post, a reader — hi, Jeannie! — responded with one of those “why didn’t I think of that?” questions. Spoiler alert: Sam’s Club won the day in our warehouse club contest. But is it worth paying for a Sam’s Club membership when you can just shop at its free-to-enter sister store, Walmart? “I let my membership lapse years ago… because I never felt like I was getting a better deal than I could get at Walmart,” Jeannie wrote to me in an email. Just like that, I knew it was time to put my detective cape back on and figure out the answer. For science. Cheap, cheap science. This time around, I’ll save you the nitty-gritty breakdown on individual prices. Not only is it boring, but they’re bound to vary depending on where you are. As it turns out, Jeannie’s assessment is pretty much on the money, at least in my Jacksonville, Florida-area stores. Each location had a couple of knock-out deals — I found grass-fed ribeyes at Walmart for a buck an ounce (!) and four-packs of spray-on sunscreen for $20 at Sam’s Club. But the vast majority of common grocery items were priced within a few cents of each other. In other words, totally not worth paying a cover. Or hauling around bags of rice that look like they were made for the Jolly Green Giant, for that matter. One caveat: Sam’s Club doesn’t accept coupons, whereas Walmart’s coupon policy is pretty open ended. So if you’re a coupon-clipper extraordinaire, your mileage may vary. At first, my discovery floored me. Why were people shelling out $45 to pay the same price for coffee that they could for free — and more for tomatoes? But there are a few key benefits you get with the cost of your Sam’s Club membership that Walmart doesn’t offer. There’s no such thing as a giant bag of quinoa at (my) Walmart. And if you’re looking for individual-serving snack packs to stick in your kid’s lunchbox, Sam’s Club’s 50-count value packages dwarf Wally World’s, which only come with 20 packs — and cost about 5 cents more per bag. But Walmart does have 5- and 10-pound bags of rice and dried beans at per-unit prices on par with the crazy 50-pound prepper versions at Sam’s Club. Value-size cereals, both name and off-brand, were also comparably priced. I will say that disposable paper items, like toilet tissue, paper towels and diapers, are actually cheaper at Sam’s Club… but only if you purchase the truly humungous package. Even then, the discount is generally about 20 to 50 cents, which you might be able to score as an Ibotta rebate on a human-sized amount of TP from the grocery store. But Walmart’s selection of vino is just plain sad. I mean, there are multiple varieties of boxed wine and nary a bottle that isn’t mass-marketed, overpriced junk, even at $10 and under. Sam’s, on the other hand, is an oenophile’s paradise, with well-priced selections from all over the world. Plus, it just introduced its own line of house-brand wines, which, if they’re anything like the competition’s, will be tasty despite their rock-bottom prices. Sam’s Club also offers artisanal and gourmet cheeses, including actual imports like Parmigiano Reggiano and Manchego. They’re pricier than the two-pound bricks of sharp cheddar at Walmart, for sure… but it’s also basically criminal to put them in the same category to begin with. 3. More Non-Grocery Goods, Like Furniture, Electronics and Housewares. If you’re furniture shopping or in the market for a laptop, Sam’s Club will likely have more options on display than Walmart. But in today’s buy-everything-online market, this is pretty mitigatable. The selection and prices online are comparable, although Sam’s Club Plus members, who pay a $100 membership fee instead of $45, do get one extra year of coverage for free when they purchase a protection plan. Unfortunately, that extended coverage deal excludes pretty much every electronic I can think of: smartphones, computers, tablets and cameras. Even the above-mentioned items might not seem worth the price of a Sam’s Club membership. You can get fancy wine and cheese at the fancy wine and cheese store. But the real reason to pay for a Sam’s card has less to do with the items you’ll regularly buy there and more to do with the peripheral perks. Sam’s has it, and it’s pretty freaking cheap — some of the cheapest in the country, per GasBuddy’s 2016 study. And although you don’t have to be a member to fill up at certain locations, you also won’t get the discount or the sweet cash-back rewards we’ll talk about next. All members are eligible for a Sam’s Club Mastercard, which offers a whopping 5% in cash-back rewards on gas purchases, including the club’s already-discounted fuel, in the United States and Puerto Rico. Say you put $100 in your tank a month. That’s $60 per year straight back in your pocket on gas alone, more than paying for the cost of your basic membership. You’ll also earn 3% cash back on dining and travel purchases, and 1% back on almost everything else. You can earn a maximum of $5,000 in cash back per calendar year. Additionally, members who upgrade to Plus receive $10 for every $500 they spend, up to $500 annually, through Sam’s Cash Rewards program. You can use those rewards to buy stuff at Sam’s, pay for your membership, or just have them cut you a check. You can get five free 30-day fills of select prescriptions, and over 600 generics on Sam’s extra value drug list for $10 or less. You may even save 8 to 30% on certain brand-name drugs — which, of course, are almost always crazy overpriced. Many Sam’s Club locations offer affordable eye exams, and all members get $40 off their second pair when they purchase two complete pairs of regularly priced prescription glasses without vision insurance applied. Plus members get $50 off their first pair with the purchase of a year’s supply of contact lenses. Sam’s Club members whose locations offer it can get flat tires repaired for free, even if they bought their rubber from another vendor. They also enjoy complimentary wiper blade installation and battery testing. As you can see, if you play your membership card right, you stand to gain a whole lot of value. As long as you regularly buy gas, your membership is almost certain to pay for itself. But here’s the thing: Whether or not a warehouse club membership is worth it totally depends on how you’ll use it. If you know you’ll forget to use your cash-back card every time you buy gas or have a bad habit of letting charges revolve and accrue interest, the rewards don’t mean a darn thing. And if you need to buy some peanut butter, you’re not going to get rich by paying the annual membership fee to save 2 cents an ounce at Sam’s. But if you’ll regularly take advantage of offers and discounts, and make sure you get your money’s worth, a Sam’s Club membership is absolutely justifiable — unlike spending $10 just to walk into a bar.